MONTREAL - When it came to the Kiss Army, I was a draft dodger. I should have been ripe for enlistment, really. Kids are suggestible, and that makeup and those costumes were pretty darn cool. But it happened that in the carefree couple of years leading up to 1975, I was part of a small elementary-school cohort of sworn Anglophiles. On the basis of a handful of songs on TV-advertised K-tel collections and a few blurry black and white snaps in Rock Scene magazine, we pledged allegiance to T. Rex, the Sweet, Mott the Hoople, pre-megastardom David Bowie and, above all, to the mighty Slade, whose platform boots, mirrored top hats, rudimentary musicianship, shouty choruses and kooky spellings (“crazee,” “noize,” etc.) chimed with something deep in our pre-pubescent souls. So when the uncannily Slade-like Rock and Roll All Nite (note kooky spelling) was suddenly all over the radio and achieving sock-hop prominence far beyond anything by our heroes, our sense of injustice was well and truly stoked. “These clowns aren’t even from England!” we cried indignantly in our Alberta suburb. If you liked Kiss, it wasn’t just that you were clearly not as discerning as us — it meant you couldn’t be our friend. Your band would fade with the first running of their (admittedly cool) makeup, while Slade would live forever. Fast-forward four years. I have a summer job in a small branch of Mister Sound, a soon to be defunct western Canadian record store chain. 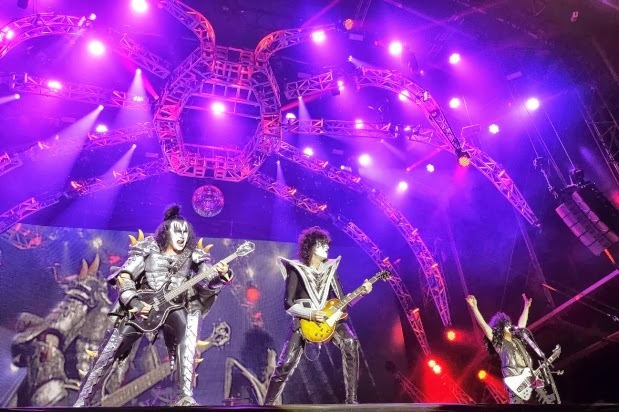 Kiss, now a globe-straddling behemoth fresh from the folly of simultaneously releasing four solo albums (records that clog up the bins of used-vinyl emporia to this very day), are enjoying a bona fide disco smash with I Was Made for Lovin’ You. By this time, I have all kinds of sound reasons for hating Kiss beyond their commercial vanquishing of my beloved Slade. For one thing, they aren’t punks, and punk at this time is clearly the One True Spiritual Path. For another, their fans are vociferous in their hatred not only of punk, but of disco, both genres and subcultures disparaged on the rather dubious grounds that they are “gay.” An act of subversive rebellion is called for, and mine, I still like to think, is ingenious: I file Dynasty, that disco hit single’s parent album, in the store’s disco section, thus forcing the soldiers of the Kiss Army — already sheepish about their boys’ dance-friendly dalliance, no doubt — to wade among the products of an alien and clearly threatening culture. That’d teach ’em! Well, as you may know, Kiss survived. When they played the Bell Centre in July, a little over 40 years after they entered a New York studio to begin recording their debut album, they were making just one of thousands of stops in an endlessly reconfirmed triumph of old-fashioned showbiz values over whatever countercultural spirit rock might once have represented. People, at the end of the day, want to be entertained. And as much as it pains me to say it, occasional exposure to Kiss’s early oeuvre has forced me to concede that, in musical terms, they’re not completely awful. Deuce and Strutter are tight little riff-rockers without an ounce of flab, with Ace Frehley tearing off solos that wouldn’t sound out of place on a Jeff Beck-period Yardbirds record; Hard Luck Woman does early Rod Stewart better than Rod himself has managed in decades; 2000 Man is, against all odds, one of the better Rolling Stones covers. I’m not about to slog through the countless subsequent releases to make sure there aren’t a few other hidden gems in there, but hey, four good songs is four more than a lot of bands ever manage. Today, when I think back to those long-lost ’70s days and remember the kids who formed the Kiss Army’s most devoted corps, it strikes me that there was a common thread: They were the tough kids, the ones who lived in low-income row-housing, who played hooky and smoked behind the church, the ones you were wary of at recess and on your way home lest they rough you up, shake you down for your lunch money, or at the very least call you gay for not liking their band. What Kiss offered those kids, I can see now, was a sense of belonging and community, a family feeling that they may well not have felt at home. That can’t be a bad thing, can it? All these thoughts have been prompted by some quality time spent with Nothin’ to Lose: The Making of Kiss (1972-1975) — by Ken Sharp with band members Paul Stanley and Gene Simmons (ItBooks, 448 pages, $34.99) — an exhaustive, respectful and riotous oral history that reads like the record of a lost civilization, a pre-Internet epoch when a band rejected by radio had no choice but to build a following one fan at a time by putting on no-effort-spared shows in any city that would have them, over and over again. I still can’t call myself a Kiss fan, but I loved this book. Besides, they are upfront about their debt to Slade, and for that alone I am willing to forgive them almost anything.